Hi there! Today we will see, based on a real example, how we can banish ugly switch-cases and enums from the code with simple polymorphism. The example bellow has been written by my self a few months ago. At this time i was convinced that it was simple and good enough. Now i know it better and i'm convinced that it could be better, more flexible and maintainable with little effort but with huge effect. The following example handles states of buttons in a game field i'm programming. What are we doing in this example? The name of my interface is not smart. It implies more then one responsabilities. 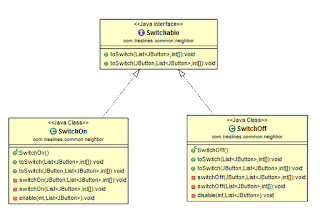 The enum and switches signals fix states to me. So it would be better to handle it over polymorphie. Let's do the changes. 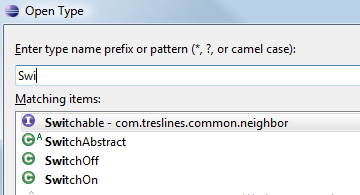 First i wanna rename my interface from EnableDisable to Switchable and let's also eliminate 2 methods. In the sequence let's declare 2 classes called SwitchOn and SwitchOff. Nice! Thats a lot more interesting. 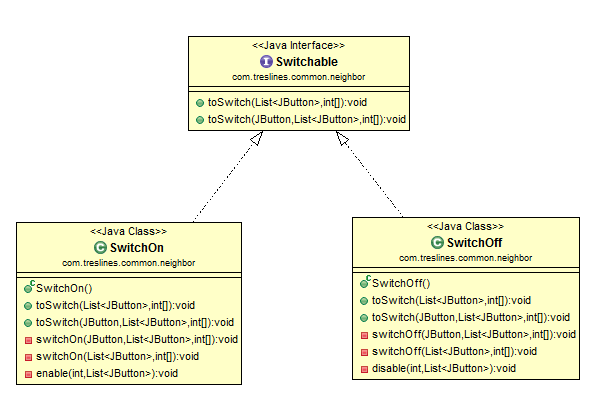 But let's take a look at the concrete classes SwitchOn and SwitchOff to be able to decide if it is good this way or not. 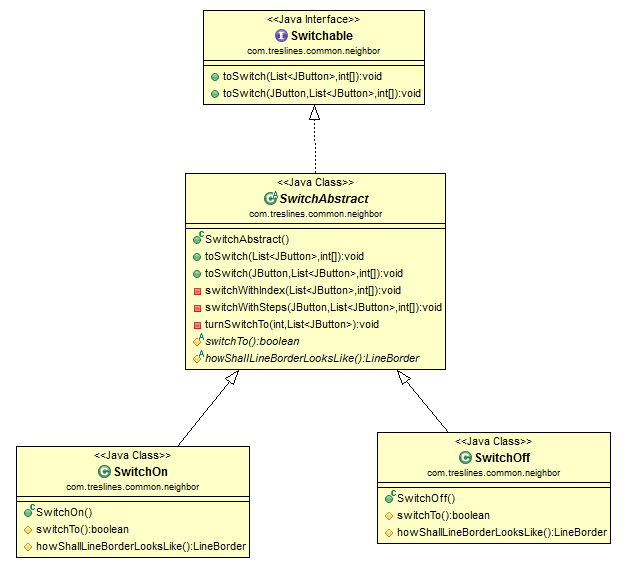 Why did i name the class SwitchAbstract and not AbstractSwitch? Well maybe you did not noticed or it is not so obvious at first sight, but i has a good reason. the reason is in the way i'm able to search in my IDE. 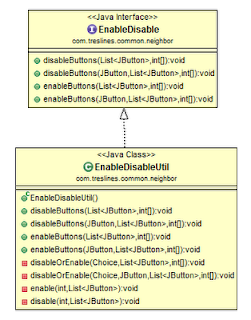 Naming my classes this way alls "Switch..." classes will be presented as a list in a very nice way while looking for the keyword "switch" in Eclipse. When talking about clean code i ofen hear the argumet: It makes my code a lot more complex and generate a lot of useless code. Well let's see if this is true. I have more classes. For this case it must be automatically more complex and of course it must be have generated more lines of code right? 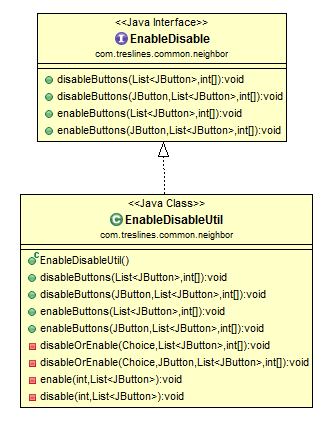 Old class and interface names: Naming was not that simple understandable. 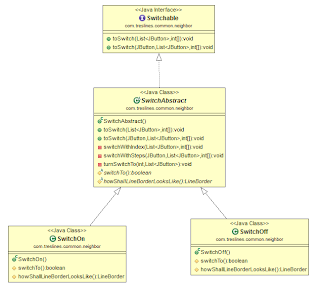 Old class implementation: Costs a lot and had ugly switch-cases and enums in it. Like it! I don't know why but programmers tend to forget everything about patterns and polymorphism when they are developing for the UI. Hmm, I'm not sure... Let's exclude naming - it really was much better at the end. But readability of the last version is much worse than readability of starting snippet (at least in my opinion, although this is quite subjective topic). And less number of lines (LoC) doesn't mean better readability or maintainability. In general I agree with your "switch replacement" approach when it is applied with moderation, balancing pros and cons. Here... Well, I think it is over the top in this case.